Posted September 12th, 2018 by Kelsi Hines & filed under Uncategorized. 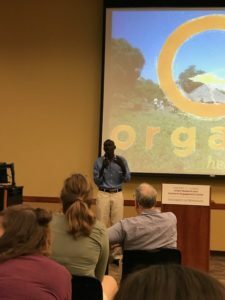 During the month of September, OHR Co-Founder Joel Oguta is in Minnesota on a Visiting Scholar Award sponsored by the University of Minnesota Center for Global Health and Social Responsibility. After hosting hundreds of volunteers and visitors in his home on Mfangano Island, this is Joel’s first trip to the United States! 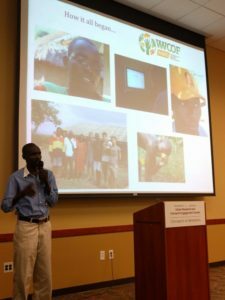 During his time in Minnesota, Joel will be helping to launch the “Mfangano Island Community Health Field Station,” a new partnership between the University of Minnesota and Organic Health Response. The vision for the field station is to cultivate community-based research, bilateral training opportunities, and foster long-term resilience among the communities of Lake Victoria. Through an adaptive “Community Health Ecosystem” model, we hope to grow transcultural friendships to better understand deep problems and cultivate creative, enduring solutions. 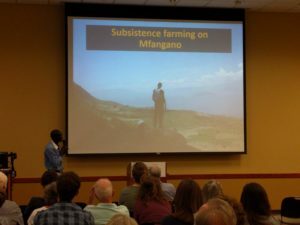 On Tuesday, September 11th, Joel gave a Community Health & Activism Talk (CHAT) called “Living Off the Land: A day in the life of a subsistence farmer on remote Mfangano Island in Kenya.” This was held at the University of Minnesota Urban Research and Outreach-Engagement Center. CHAT is a monthly series of talks around matters that are important in health and healthcare delivery.